The Best Western Empire Elysees has a great location near the Champs-Elysees and is ideal base from which to explore the city. Rooms are equipped with flat-screen TVs with satellite cable, free Wi-Fi, minibars. Buffet breakfast is daily. The hotel also features a bar and lounge. 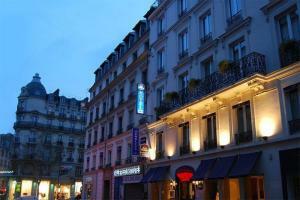 The Eiffel Tower and Arc de Triomphe, and other popular attractions are all within walking distance of the hotel. This hotel is about 17.5 miles from Charles de Gaulle airport, 15 miles from Orly Airport, and a mile and a half from Porte de Clichy Train Station. The Ternes metro station is less than a quarter of a mile away.